Storage auctions have been popularised by recent reality television shows, although thankfully by their very own topic of competing over other unfortunate people’s belongings they have definitely not become over glamourised either. Whilst storage auctions and such means of selling off possessions of defaulting tenants have always been going on, the general public are realising that their local self storage facility has more dimensions to it than a simple piece of subdivided warehouse space. As people in this day and age are mindful of making a quick buck or two on the side, or want to escape the rat race, getting deep involved in storage auctions could give them a nice earner. Amongst the piles of neglected items might be some very worthwhile investments, which could lead to a new stream of income. This is all very well and good but how do you actually know that the storage units near you are putting on an auction? You could ask your local storage companies to put you any relevant mailing list so that these notifications come straight to your inbox as and when they happen. In fact quite a few websites are engineered around people simply signing up for these sorts of updates. You could get in touch with storage companies and ask to bid remotely so that you don’t even have to leave your house in order to participate. They can probably send a small amount of info and a photo so you can get a potential perspective of what is being sold off from the storage unit. Your bid will therefore be accounted for when they run the live auction. You might be in luck and there could be a website directory for storage auctions in your area; however for most people digging a bit further for news in this area might mean having a look at the advert sections of newspapers, in their hard copy or online incarnations. Particularly in the local news arena there should be some useful pointers here. 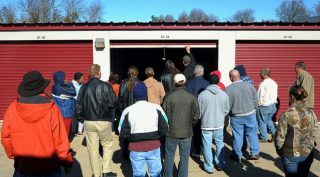 Failing that there are forums online dedicated to discussing storage auctions, and you may be able to pick up some hints here from storage companies that make their listings online, to other bidders discussing upcoming storage auctions in their and your area. The big issue to bear in mind is your competition. You may find some big storage auction adverts in your local paper, but realistically isn’t everybody else going to be at those, including many casual inexperienced bidders? The secret is to really try and get in with the local storage companies, perhaps those that don’t advertise too widely, and try to get to some of the more obscure and unknown auctions. These will have a lot less people attending, and hopefully it should be an easier and cheaper solution. Ringing around storage companies to find out when they are putting on auctions might be a bit time consuming, but to get the info from the horse’s mouth is clearly the most reliable option. However for convenience’s sake there are adverts, website forums and directories for further advice and discussion. Be mindful that the more public the auction, the busier it will be and the more likely you are to be outbid, so do some thorough research and investigation to reach those auctions that others may not have necessarily heard about yet.